Fire Sales of collectors !!!!! ????? Re: Fire Sales of collectors !!!!! ????? 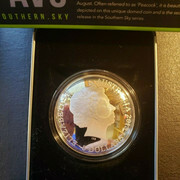 Panda expo 1 1 oz silver. 32 sold. Not sure who get this deal. It has haze and white spot and also not states any box and coa or NOT. 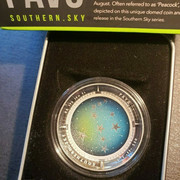 This is the Southern sky Pavo silver coin 2013 which i will bid if there is no faint dot. This worth 160-180. Sold item in varieties of western and eastern coins by. The panda expo 1 PF69 NGC at 80 which is a good deal I never came across even it has white spot. This is real seller which some of my customers has obtained the items bought from him. Take note numic need holding power which fire sell in soft market tend to loss money. Numic is not easy liquidate item/investment compare to share & bullion. It just like a multi mio real estate which take long time to sell in soft market which you need a seller and buyer at right time else you will sure in loss condition. Therefore buy it within you financial ability and do not need fire sell to loss money. It just like comic books which numic can bring you very good margin like other investment while fulfill your hobby and collection need. However, you must also consider other flip sides of it which is not easy in liquidate if you buy at peak and high price. You might notice one sellers in ebay who I deduce is selling off his collection at soft market with floor list price and .99 bidding. a number of his items were fetch a reasonable soft market price minus 10-20%. He has sold few round of the collection and left something only. Do he has more to sell? You might get a good deal slight below market price. However he did mention in the listing clearly that a number of his items with haze, white spot, red spot and spike.